A few days ago, Sandy and I went to the Elias Lalaounis Jewelry Museum downtown. The museum sits under the Acropolis rock and the museum building is the former Lalaounis family home. Lalaounis was a goldsmith, jeweler and jewelry designer — likely Greece’s most loved and famous. His education was economics and law, but being a fourth generation jeweler, he stayed in the family business. He founded the association of Greek Jewelers; having spent 25 years as an association executive, this little fact made me deliriously happy. His work was first inspired by ancient Greece — the Minoans, The Mycenaeans, Byzantium. His collections — chokers, earrings, bracelets, rings, necklaces, headpieces, body jewelry — are astoundingly beautiful. Sandy said that some of these classical pieces are so simple they look modern and very contemporary. His collections are also inspired by and named for Celts, Vikings, Pre-Columbians, Persian and Native Americans. He designed earrings for Jackie O in honor of the the moon landing, and in fact there’s a whole lunar collection in the museum. His original designs were done in gold plated silver. He’d finish and then essentially crowdsource them, and the most popular would be made from solid gold. He was the first European jewelry designer to use 22K gold. He designed the current Olympic torch, which is housed in Olympia and is brought out every two years when the flame’s journey begins. He’s the only jeweler in history to have designed the torch. In 1986, he also became the only jeweler to be inducted into the Academie of Fine Arts in Paris. His museum houses the sword given to him when he was inducted. The Academie swords were originally designed by Salvador Dali, and when Dali became too frail to continue, he named his close friend Elias Lalaounis to continue his work. In 2016, the museum received a grant from the Stavros Niarchos Foundation for an ‘artist in residence’ program — essentially an internship. These designers competed to be accepted into the program and now they get to do their work in the museum workshops. One workshop is for metal and the other is for everything but metal. We watched a young artist demonstrate how she makes metal jewelry with filagree and other extraordinary details. One pair of earrings takes two full weeks. Upstairs in the other workshop, a young artist was working with lucite. Another artist had turned cigarette filters into pendants. All of these young artists were beyond thrilled to have this residence program on their resumes. Lalaounis has galleries and jewelry stores in several cities, including New York. Lalounis died in 2013 and his four breathtakingly beautiful daughters continue to run the firm. The museum is a real gem – ha – unique and interesting. It’s small so not overwhelming and a visit could be easily combined with another downtown destination; for example, lunch at the Acropolis museum, which we did. With the weather a little cooler – and the sea unswimmable – we are practicing yoga on our sea-facing patio (photo) and taking long urban hikes through Voula, Glyfada and Vouliagmeni. We’ve found great parks, nice walking routes along shaded streets or the sea (watching for oil and cleanup efforts along the way). The other day Demetri and I went into Athens and walked to Filopappo Hill, the highest of three hills just west of the Acropolis. In ancient times it was known as the Hill of the Muses; it’s now named for a monument to Filopappos, an exiled Roman senator who settled in Athens, became an citizen and politician in the first century. Also here is Pnyx Hill, which I’ve pictured in my head thousands of times as it’s where ancient orators and philosophers gathered to discuss politics. These two hills, along with the Hill of Nymphs, connect together as a park with views of the Acropolis and the ancient theater, but the entire city of Athens (museums, churches, patches of green here and there, long streets stretching all the way to Piraeus) and the Aegean sea and even the Peloponnesian mountains in the distance. It was an incredibly clear day. Corrupt. Highly bribable. Dishonest. Bloated. Inept. These are the words I’ve heard to describe the Greek government. The September 10 oil spill – 2500 tons of oil sank in 15 minutes – and the events that followed sure lend themselves to proving these descriptions true. On 15 September after school, Demetri and Peter took the paddle board down to the end of the block, and were back 10 minutes later with oil on their feet and the board. There were clumps of tar and oil in the water and sand and on the rocks. My happy Instagram (kfefes) post Friday afternoon was irrelevant (and sad) by 345 pm. The tanker was anchored off the island of Salamina, near the port of Piraeus, Greece’s largest, busiest port. Nobody seems to know why it sank or how much fuel escaped into the water before divers sealed the wreck, but they didn’t move fast to contain it. The oil has polluted the entire Athens coast and there is no swimming. We’re totally crushed, of course, because it’s still very much summer here and the beaches are quite nice along the “Athens Riviera” where we live. Several of the nearby beaches have earned the prestigious ‘blue flag’ designation – an international certification that a beach or marina meets stringent water quality and sustainability standards on an annual basis. Blue flag is now useless and it could take months – some say years – to clean the beaches and the water. Ecological damage is said to be incalculable. Floating booms to contain the oil have been set up and 20ish other ships are helping with cleanup. From what we can see, one of the booms has broken. The guy in charge of cleanup has been arrested for smuggling oil; and that hullabaloo caused the cleanup to be suspended earlier this week. Lots about this is hard to understand. Nobody (authorities) seemed to panic. They underestimated the scale of the spill and didn’t move quickly to assess and contain. Blame is flying to the boat’s captain, to the merchant marine minister, to the controversial prime minister. The minister of Agriculture issued a ninny statement saying blame lies with ‘everyone around the world who uses fuel and oil.’ And it’s astounding to see the people of all ages who continue to swim, swearing the water is fine. 10 days after the spill, there was a photograph of a woman covered in tar from the waist down on a beach just north of us. Another person reported that he made a corridor to avoid stepping on tar that still gave him access to the sea. Perhaps they believed the Shipping Minister who, 4 days after the spill, said officially that it was safe to swim. Last Monday, we went to beautiful Vouliagmeni beach, just a few miles down the road from us, because they had reported clean, unpolluted conditions due to the protected nature of the area. There was an oily film across the surface of the water. Beach authorities are claiming it’s not polluted. It’s hard to know what’s true and not. We’ve been surprised at both the defiance of the locals who refuse to stop swimming and the lack of public outcry. I guess it’s the same thing. There’s no BP-esque camera monitoring all the cleanup. It was news for a few days, but in the last week, the only updated reports I can find (other than a brief story about political arguments and party denouncements in Parliament relating to the spill) are from US media. Greek media is essentially controlled by the state. Mayors of certain affected cities, plus the WWF, have filed suits against anyone responsible. Fish consumption is down 60%, fishing related businesses are making severe cuts, and environmental damage won’t be known for a while. It’s going to be interesting to watch this unfold and become a case study for the greek ‘system.’ I hope they get it right and surprise everyone. In other news, Demetri replaced our broken toilet seat. The new one is bright green; he felt it worked nicely with the navy blue sink and tub. Not false, but I don’t think we’re on the same page. A few recent photos. Moana artwork by Peter. Michael got off the bus Tuesday afternoon and said, “I need to learn Greek, like, right now.” He was smiling as he said it, so that seemed ok, but he looked a little fried. Peter said, “my day was awesome, it was someone’s birthday so we had cake before we got on the bus. It was pink cake but it was still good. I also remembered the name of my other friend – it’s DEMETRI!” We changed clothes and went to Vouliagmeni beach to decompress and blow off steam. I had written a note Monday night to Michael’s teacher and put it in the ‘correspondence’ envelope asking for an appointment to meet her and talk about 2nd grade. Michael wasn’t sure where to put his books and notebooks, he didn’t know where the bathrooms were or how to ask permission to go, so I thought we could cover all of those things in a quick meeting. Michael also said that he did a little math, but for the rest of the work he didn’t have to do because he didn’t know Greek. That was a red flag. He said he did his own thing on the playground because his friend from the day before played with his other friends. Oh dear. We had our family meeting that night and listed our bubble up and bubble down for the day (the best & worst thing that happened – an Aspen tradition we learned in kinder), and Michael’s bubble down was his lack of understanding of the language, but his bubble up was that he perfected something on the monkey bars. So in all not bad, but I didn’t think so in the moment. I was freaking out (shocker). Wednesday morning I wrote a note to the school admin with a list of questions – some were logistics (is there a school calendar? Is there a uniform for swimming?) and asked for a meeting with Michael’s teacher. She called around noon and asked if we could come to school the following day and meet with the teacher and the head of school and her to go over everything. Bubble ups and downs that night were not school related – which seemed like an okay sign. We had individual family meetings that night and Demetri asked a lot of brilliant yet gentle pointed questions and the answers were just fine and the boys were ok. Not just ok, but normal and happy. And, they think the bus is super cool. We went to the park. Demetri was such a statesman during the meeting. He thanked them and said that we were told in the summer that a plan like this might happen, and that we were so thankful that they worked quickly to figure this out. After all, it was the 4th day of school not the 4th week. We were very encouraged and could tell that they’d been working on this for a day or two already, so we were all on the same page or at least close. I wasn’t a statesman so much; every time I opened my mouth I had tears in my eyes and a cracked voice. I stopped trying to talk and just took notes after that. Michael came home Friday afternoon announcing he “crushed it in Greek class today.” He learned the word for ball, bite & duck, and he told me that I am wrong when I say “Έλα” (ella — come) and I need to say a different word (“Έλαti”) if I’m telling more than one person to come. (Score!) We have homework in Math and Greek. Papou is gone til Sunday, so the boys get to do what they like today. Peter’s story is a little different and not as challenging. I think his teacher, Kyria Anna, speaks a lot of English to him. He has also deputized himself the English teacher when Kyria Eleni, the kindergarten English teacher, isn’t there. Kyria Anna has a puppet monkey as her assistant; Peter has a puppet lion as his. So, regardless of how much Greek Peter learns, he’ll make darn sure the other kids learn English. In reality, he’s of course going to learn a ton of Greek. His situation is lower pressure – he’s in the perfect spot to learn letters, sounds, numbers and begin to read. We always figured that if he needed to do kinder again in CO, no big deal. He has a late August birthday so he might need more time emotionally but also for reading and writing in English. His first week was a lot of talking and meeting and and social-emotional – this is the first time that a lot of his classmates have ever been in school. He told me about a book they read about a turtle who had to go to kindergarten and didn’t want to and his parents made him go but that at the end of the book the turtle was happy. His Friday announcement was that he ‘created’ a girlfriend that day. He hasn’t played with her yet but he did comment on her improved table manners. He has homework also. Papou might have a busy afternoon tomorrow. So guess what? Kids ARE adaptable. New stuff takes time. We knew this would be hard. We tell the boys that what they’re doing isn’t easy and that they’re brave for trying and for being themselves as they do and how proud we are of them and how proud they should be of themselves. Michael told me last night as I was tucking him in that he’s been nervous all summer, but he’s ok now. I’ve thought a lot this week about parents who move to the US and don’t know the language and can’t fill out forms, read school emails or talk to their child’s teacher. I wonder if they have google translate (which is mostly ok but can be quite goofy) or someone to help. I’m sure they feel excluded when other parents don’t talk to them at school events or in the halls. I’m so grateful to my mom-pals and everyone who made us feel welcome at our various new schools. One of my closest friends came up to me during Michael’s first week of kindergarten and said, “Hi. are you new?” I recall a family from Michael’s Pre-K class who moved from Argentina to Denver. The mom told me once in the hall that she didn’t come to the meetings and parties because she couldn’t understand the slang the parents use and she didn’t understand what the teachers are saying (back to school night, for example), so her husband goes. I hope we made them feel comfortable and greeted them with friendly faces. I remember seeing that sweet little girl holding hands with other girls within a couple of weeks. At the time, her older sister was in second grade. I registered for Greek school myself. It starts 2 October. 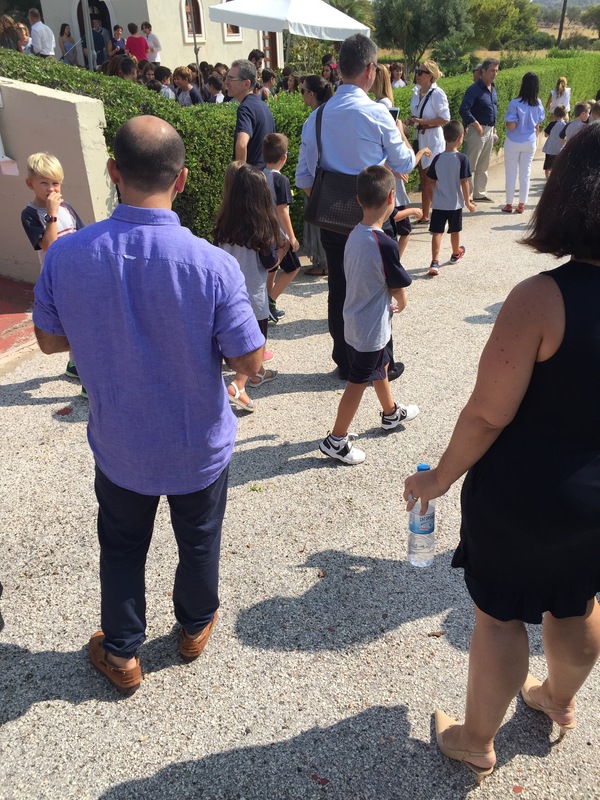 Summer ended abruptly September 11 with the first day of school. I’ve been terrified about it for weeks. Terrified to the point where sometimes I’d push it away when it floated into my mind. 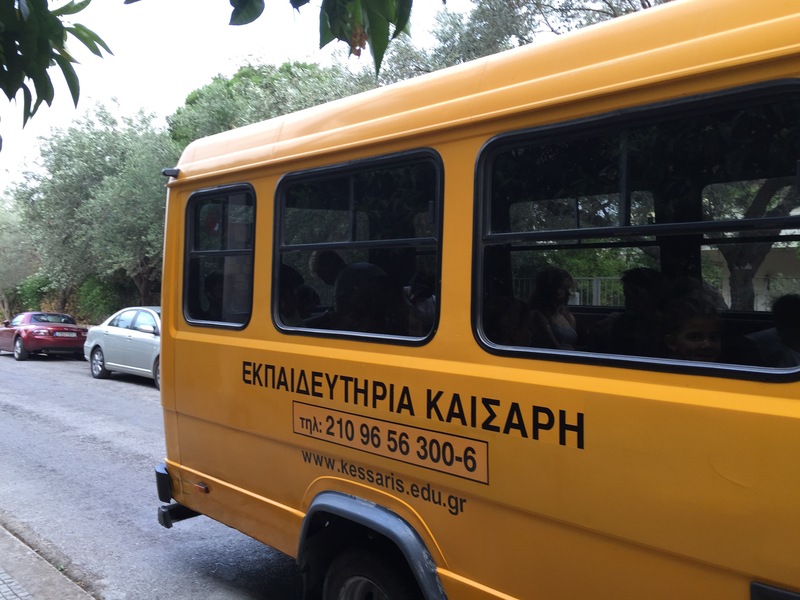 We’re not making it easy on the boys; instead of sending them to English-speaking British or American school, they are attending a Greek school. We speak a tiny bit of Greek – niceties, food & some consumables, but we don’t know the alphabet, letter sounds, numbers past 12. When we chose the school, we were thrilled with the character and leadership philosophy. Kessaris teaches kids how to learn, how to think, and that it’s safe to make mistakes. It feels a lot like the philosophy of Aspen Academy. And this year away is about building confidence, being brave and resilient, learning a new language and feeling what it’s like to be different. It seemed Kessaris would be a safe enviornment for this. Plus, we have Papou upstairs to help with homework, fill out forms, and procure school supplies. So in theory, I was all in. And I was psyched. Kids are so adaptable. And at their ages their brains are in perfect condition for a new language. In reality, I was petrified. I felt like a bad parent ‘making’ them do this. Sure, kids are adaptable. I read lots of articles and books telling me this. But these are MY kids – sweet, shy, curious Michael who follows rules and always wants to do it right. Outgoing, tender-hearted yet tough Peter (whose ‘real’ name is Panagiotis), who can be scrappy if he thinks trouble is coming his way, and gets his feelings hurt easily. I was afraid that they would be excluded, or worse, made fun of for being foreign and not speaking the language. I worried that they wouldn’t make friends and I had visions of them eating and playing alone. 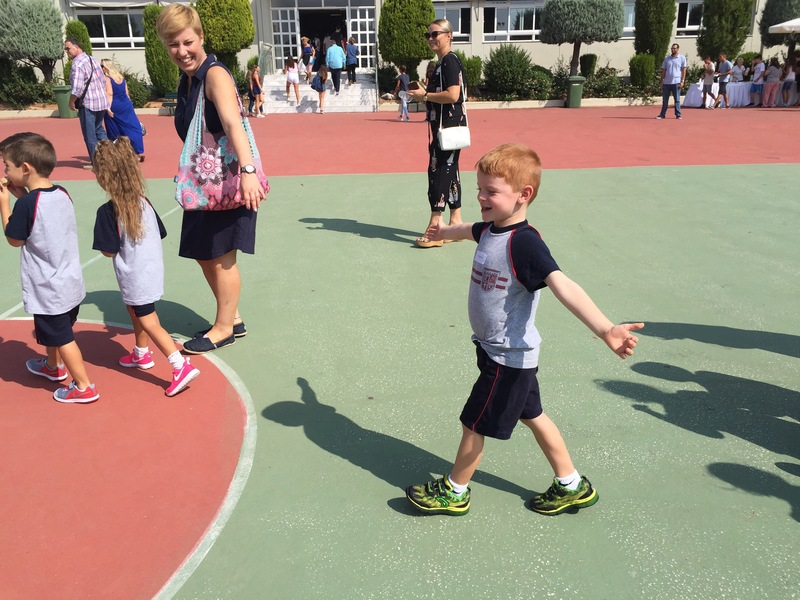 Kindergarten had a meet and greet the week before school, so Peter got to see the classroom, play with puppets, animal figures and play dough, see what his name looks like in Greek (Παναγιωτης). They didn’t have anything like this for the rest of the primary school, and they don’t tell you which class you’re in until you get there. So we didn’t have the same orientation for Michael. We chose the bus for transportation. Demetri thought it would be a place to meet kids; that it’s an important rite of passage. He also thought that riding it the first day was important — they get all of the ‘new’ stuff at once instead of dragging it out over a few days and being new kids all over again. He also pointed out that on the first day there would likely be millions of adults getting kids from the bus to class and back, and that adult help could diminish the second week of school and the boys will be better off knowing every inch of the path to and from bus to class right away. He was right, of course. So … the bus pulled up to our building Monday morning, we all met the driver and the teacher who facilitates loading, seat belting, backpack storage and classroom delivery, and off they went. 1.7 seconds later, we jumped into Papou’s car and followed it. Yep, sure did. On the way, I told Demetri that I was glad I married him because he is brave and adventurous and loves new things and thinks way ahead and I’m reactionary and afraid of the unknown and always worried. He didn’t understand a word of it because I was sobbing. I blew my nose and repeated. We beat the bus to school but we could not go in Michael’s classroom because it was 830 and class had started. I asked how we could meet his teacher and it’s by appointment. Will do. We planned to stay for the prayer blessing (remember, there’s no church/state separation here), maybe meet some parents, and see the boys. Peter said he had a field trip on his first day because they loaded the kindergarten onto school buses and drove them the 100 meters to the upper school. We saw Michael walking with another boy who looked to be talking to him and Peter had some sort of snack in his hand and got ‘splashed’ (holy water). 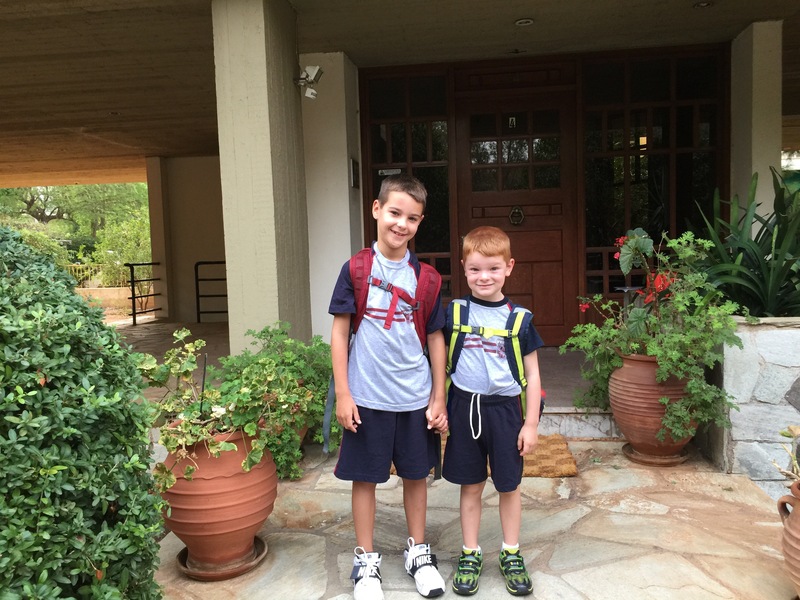 They got off the bus at 2:55 and reported a great first day – each met a friend and Michael’s friend has lived in the US so he speaks English, they love the bus, they get to eat lunch and snack on the playground, they played games all day in school. Back at our apartment, the day was topped off with the kindest gift from one of our neighbors. Eva made a giant bundt cake for the boys and decorated our front door with balloons to celebrate their first day.